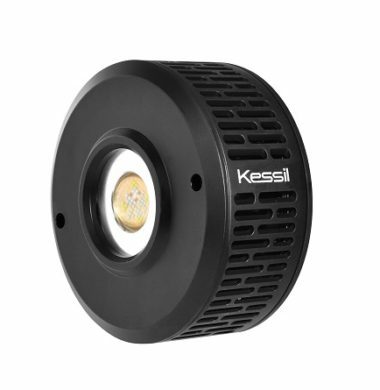 The Kessil A360x Tuna Blue is the first of two new LED Lighting fixtures by Kessil. The A360x Tuna Blue has been modified and improved from its predecessor to offer 25% more output in lighting, whilst also maintaining a 30% slimmer design profile than the previous moel, the A360. The A360x Tuna Blue can also be coupled with the Spectral Controller X (SOLD SEPERATELY), to allow for a full spectrum customisation (Red, Green and Violet + Indigo) instead of the standard Tuna Blue settings. 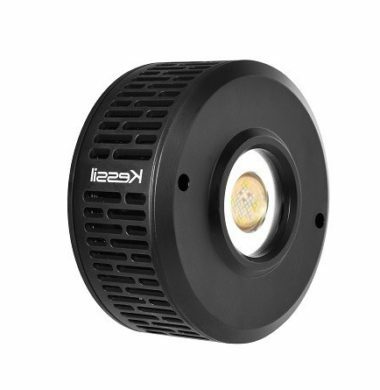 The Kessil A360x Tuna Sun is the second of two new LED Lighting fixtures by Kessil. The A360x Tuna Sun has been modified and improved from its predecessor to offer 25% more output in lighting, whilst also maintaining a 30% slimmer design profile than the previous model, the A360. The A360x Tuna Sun can also be coupled with the Spectral Controller X (SOLD SEPERATELY), to allow for a full spectrum customisation (Red and Amber) instead of the standard Tuna Sun settings. The Kessil Spectral Controller X offers the ability to control and alter the spectrum of Kessil LEDs, including the new A360x Tuna Blue and Tuna Sun. 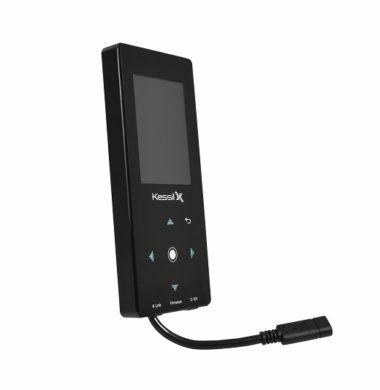 The Spectral Controller X can also communicate to multiple Kessil LEDs through the use of either the ‘K-Link’ or ‘0-10V’ connection leads, meaning both the newest and previous generations of Kessils can be controlled. The Gyre XF 330 is the smaller of the two newest Gyre models released by Maxspect. The Gyre XF 330 not only features Maxspect’s trademark Silent Wave Technology, but also their new Flow Director, which enhances flow direction within the aquarium. This results to moving water to any place in your tank whilst blocking light from your fixtures, thus slowing algae growth on the pump itself. The Gyre XF 350 is the larger of the two newest Gyre models released by Maxspect. 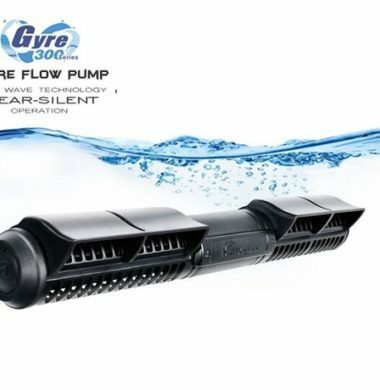 The Gyre XF 350 not only features Maxspect’s trademark Silent Wave Technology, but also their new Flow Director, which enhances flow direction within the aquarium. This results to moving water to any place in your tank whilst blocking light from your fixtures, thus slowing algae growth on the pump itself. 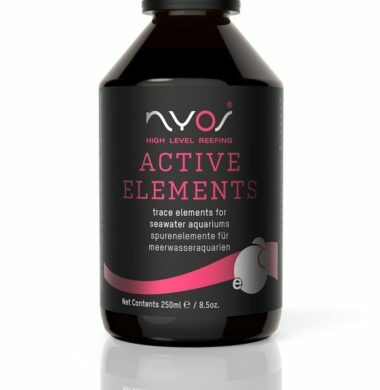 Nyos Active Trace Elements allows the Aquarist to efficiently add and replace the Trace Elements present in seawater that are consumed by the corals within. Nyos Active Trace Elements promotes the enhancement of colour within the coral tissues. Nyos Active Strontium allows the Aquarist to efficiently dose Strontium into the Aquarium, after it has been depleted by the corals within. Nyos Active Strontium offers the ability to promote strength within the skeletal structure of stony corals. ReefBrite Live Rock Enhance is ideal for Reef aquariums, Fish only aquariums, with or without live rock. 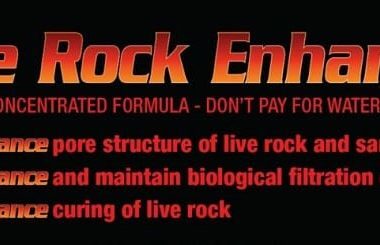 Live Rock Enhance cures new live rock faster and more completely via microbial and enzymatic action. ReefBrite Reef Enhance creates real MICROPLANKTON for your reef aquarium. 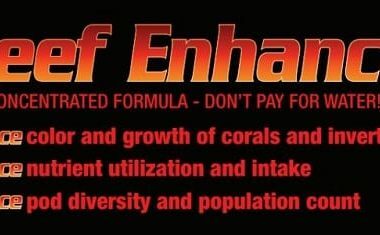 When used in conjunction with popular coral foods Reef Enhance improves the utilization for even better results. 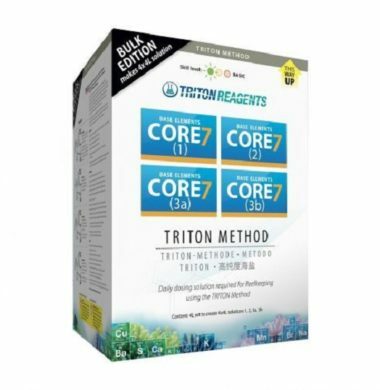 Triton Core 7 Base Elements is a newly re-formulated super-concentrate (7X) of the Base Element products used by the Triton Method. This concentrate combines the essential macro elements with a scientifically formulated suite of trace elements to replenish those consumed in the daily function of your reef system. PLEASE NOTE: THIS ITEM, ONCE PURCHASED, IS TO BE COLLECTED IN-STORE UPON ARRIVAL ONLY. PLEASE ENSURE YOU SELECT THE RELEVANT OPTION AT THE PAYMENT SCREEN, OTHERWISE YOU MAY BE CHARGED FOR POSTAGE. Whether its a gift, or you just fancy treating yourself, the AAC In-Store Livestock Discount Card is the perfect solution for obtaining AAC’s quality livestock at a reduced cost! 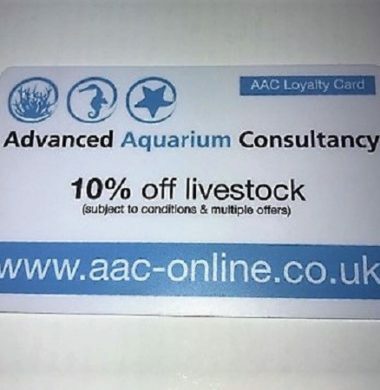 The AAC In-Store Livestock Discount Card is valid from November 2018 to November 2019, and offers the user to the entitlement of 10% off of any LIVE product (be it fish, corals, or invertebrates) here at AAC, that isn’t already on a multi-buy deal or otherwise discounted. For more information, please contact the store. 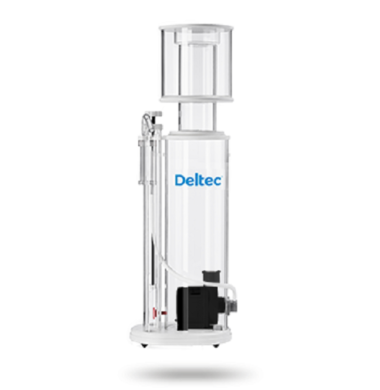 The Deltec SC Pro 400i Internal Protein Skimmer is a new innovative internal skimmer from Deltec. The Deltec SC Pro 400i is the smallest in the new ‘i’ DC range of Skimmers. The Deltec SC Pro 400i includes a new sleek design to the skimmer body, and includes minimum and maximum adjustment level marks on the outlet pipework for easy set up. The Eheim Autofeeder allows the Aquarist to safely and regularly feed the livestock within their Aquarium. 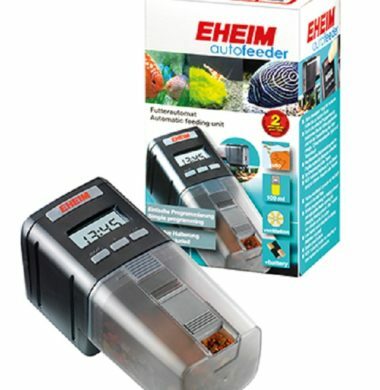 The Eheim Autofeeder also offers the Aquarist the ability to leave their Aquarium in confidence for a period of time, knowing that it will be fed without the need for people to manually feed the inhabitants in their absence. 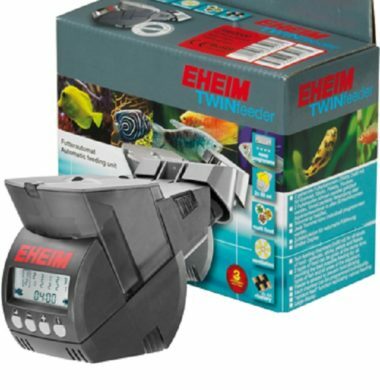 The Eheim TWINFeeder allows the Aquarist to safely and regularly feed the livestock within their Aquarium. The Eheim TWINFeeder also offers the Aquarist the ability to leave their Aquarium in confidence for a period of time, knowing that it will be fed without the need for people to manually feed the inhabitants in their absence. The Eheim TWINFeeder contains two compartments, allowing for two alternative feeds to be dispersed into the Aquarium as designated times throughout the day.